Fr. Unlisted. 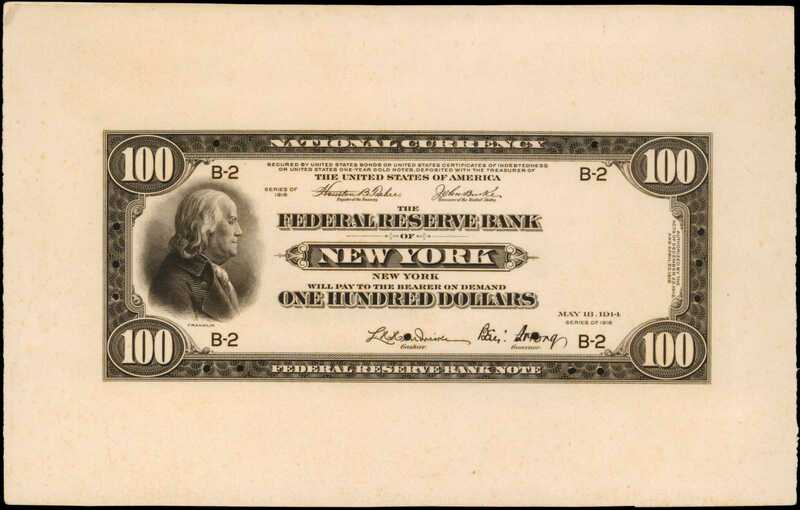 (W-Unlisted) 1915 $100 Federal Reserve Bank Note. New York. PCGS Currency New 62. Face Essay Proof.Hessler-FRBE10. India paper on card. 12 small punch cancels at the border design and an additional two through the banking signatures. Left, Benjamin Franklin profile vignette without frame. Style of the 1915-18 series with center titles and NATIONAL CURRENCY, FEDERAL RESERVE BANK NOTE within top and bottom borders respectively. Shown with Teehee - Burke, Hendricks - Strong signatures. Inscription at top reads "SECURED BY UNITED STATES BONDS OR UNITED STATES CERTIFICATES OF INDEBTEDNESS, OR UNITED STATES ONE-YEAR GOLD NOTES, DEPOSITED WITH THE TREASURER OF." The inscription was reworded substantially throughout this series, the present being the longest of the group. This denomination and type in any form is unique in collectors hands. Hessler lists a single other, a 1915 dated New York branch impression that is part of the Bureau of Engraving and Printing collection. Certainly a prized piece within the Caine Collection and an item that will forever be among the most desired federal proof notes in existence.Ex. Harry E. Jones; Dr. Glenn Jackson Collection; Nascas (a division of R.M. Smythe) sale of June 16, 1990, lot 3305.